This week survival food has had nothing to do with the freeze-dried packs you can get at REI. It does have everything to do with garlic bread sticks, enough to ensure lifelong protection against vampires, protein bars, and corn tortillas. I actually made a food plan for next week and I’m really hoping I’ll look back on it in a few months and laugh at the lack of variety, but for today I was pretty pleased to imagine a few meals that didn’t include garlic bread and would still, very likely, make it into my youngest’s picky little tummy. I also spent some time making a new dish today that at least everyone else in the family likes, so that was a nice score. It’s a lentil dish, and I realized that as often as I’ve made lentil soup, I’ve never just cooked up a batch of lentils, so I did and they are awesome. I cooked them with a small onion, two garlic cloves, two chopped carrots and one chopped leek, plus a bay leaf and some veggie stock. After about 25 minutes I drained the excess water and added Tuscan salt (a blend I buy at whole foods), pepper, olive oil, red wine vinegar and squeezed some lemon over it all. It was surprisingly good~ as my oldest said when he asked for his second bowl of it, “I didn’t expect it to be so tasty since it is healthy.” I ate mine with gluten-free bread that I made fresh today. I used Manini’s brand but substituted the eggs with applesauce since I learned I have a severe intolerance to eggs. 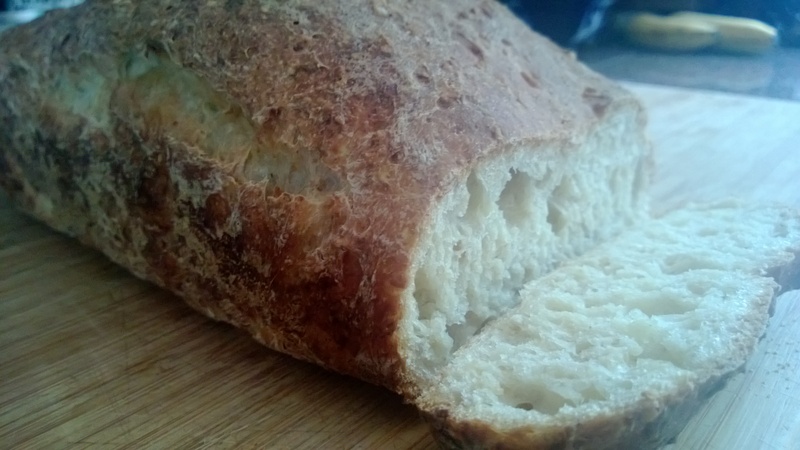 The bread was really good, and it was a great accompaniment to the lentils. (No pic of the lentils b/c they just aren’t that photographic.) For my youngest, he has at least been trying new things on a daily basis. He has found a new cereal he likes, a new gluten-free cereal bar (glutino), pepperoni, and although he wasn’t thrilled to do it, he ate half of a veggie dog tonight. He first asked if it came from a live animal or not, then double checked that it really, for sure, indeed did not. I’m not sure where he thinks bacon and pepperoni come from, but until he eats beans and /or nuts, I’m not going to mention it.